Ok, this post IS was a giveaway post but you absolutely may not cheat by dashing off to the comment section, ok? I'm actually going to make this giveaway harder for you to enter and while I write up my review of the book I'm going to think of a way to keep you from entering for the sake of entering a contest. On this one, I'm not concerned with numbers in. the. least. I'm interested in sharing a journey with one of you. Hence, this post is going to be long and personal. Ready? 2. She wasted her time in writing the book. Ok. Now. Here's where I make a terrible confession. Are you ready? I really do not connect with DeMoss very well. I've read a few other books and I never really "got" her. Sure, she has really good messages and I can approve and agree but without enthusiasm. Not so with this book. I wouldn't call my reaction to it "enthusiasm" so much as, "Oh this is just GREAT, God. Why this? Why now? I don't want to do this." This read just wasn't very simple, I'm afraid. Not at all. First, it engaged me. Then it slapped me in the face. Then it made me feel guilty. Then it made me feel convicted. (Then it annoyed me...) Then God spoke to me and said, "You think it was an accident that I had this book sent to you at the end of November?" It wasn't really a question that I wanted and/or needed to answer. I knew the answer. This book's arrival in my mailbox was no accident. It was a lesson. "What He has promised me is eternal life. What He has promised me is abundant life. What He has promised me is love, joy, peace, patience, gentleness, meekness, and self control. He has given me all of Himself in exchange for the rights to my life." Quite frankly, this year has been one of intense struggles and hardships for Jonathan and I. We have suffered death and false accusations. We have lost valued relationships and cried a thousand tears (at. least!). Oh, how anxiously we have been looking forward to the end of 2009! We feel like we've just been dragging ourselves to the finish line of this year, hopeful that in 2010 we can experience some long-awaited peace. So, you see, it was rather ironic that I would come to the end of a season, that I feel rightfully justified in complaining about, to have God say to me, "Or...you could choose to be thankful." What? Thankful for 2009? You've just GOT to be kidding me! (Ever had one of those years?) The last thing I'm thinking about is how grateful I am for what we've been through. And one of the hardest things about the year has also been that we've discovered how few people know how to deal/handle/treat people who are genuinely hurting. It's easy to laugh and be joyful with those who are happy. So easy. It is extremely difficult to weep with those who weep. Yet - it is a command. People can't pretend to be hip-hop happy when someone near and dear to them just died. Ok? Don't expect it. When someone is going through horrible relationship issues with people who are close to them, you cannot expect them to dance around singing "If You're Happy and You Know it." Those are not the times you feel like you have the joy, joy, joy, joy, deep down in your heart. You are an endless well and flood of tears. And if people expect you to just produce the chuckles on command then they are rather being heartless. Not necessarily intentionally, but all the same - heartless. Pain doesn't go away just because someone snapped their fingers and asks, "But what is going on that is GOOD?" (as if to admonish you into happiness). "I don't want you to be destroyed by the inevitable downturns of life - with no answer for the darts of unfair, unpleasant circumstances - a walking bull's-eye, just waiting for the next arrow to be shot in your direction. I want you to find the God-given reserve to stand strong in the midst of confusing, condemning onslaughts of opposition. I want your head up, lifted by the empowering Spirit of God within you, even when everything else within you is calling for a week in bed with the lights out and the blinds drawn. I want your story to be rewritten into a tale of God's grace, one that He uses to help you be an effective minister of His hope and healing to those who are walking with the same kind of path. I want you to be so available to His Spirit's leading, so aware of others' needs, and so willing to be open and genuine, that God takes the things Satan meant for evil and transform them into things of value. I meant to just finish this year. That's all. Just finish it. That's all I was asking for. But it turns out that God is asking me for more. He's asking me to be grateful for it. It is not easy. Not at all. But I am willing to try. To that end, I started a gratitude journal which I am mentioning to you as a sort of accountability to me. 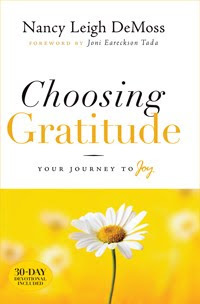 At the end of Choosing Gratitude there is a 30-day devotional which works well for me as there are 31 days in December and it has been and will continue to carry me through the month of December. Hard years are not really wanted. There is no denying that. But we can choose gratefulness even at the end of them (maybe even at the beginning of them - or during them! Hmm? Well . . . maybe.). I've not yet reached perfection (obviously). And again, it does no good whatsoever for one human being to walk up to another and say, "Well, I hear you saying you are having these problems....now say something positive." Where do people get off with that? Humans cannot change human hearts. But God can. And, in my particular case, He selected this book, at the end of November, and provided a journal as a gift, and told me to write out what I'm grateful for. And you know what? Keeping the journal has helped. Reading about and thinking about what I'm grateful for is helpful. I would love to invite you to win a copy of this book. Moody Publishers has graciously offered a second copy to one Reading to Know reader. I think, what'd I'd like to do is ask that you not enter unless you truthfully intend to READ this book. Don't enter just to win a free book. Enter to read it. Secondly, list one thing that a.) you are not currently grateful for, but would like to at least not be bitter about or b.) one thing about this past year that you truly are grateful for. Perfection is not required to read this book. Only a willing heart. I listen to Nancy's podcasts and find them to often challenge me and also her devotional books have really convicted me and helped me grow in my time with God. I do intend to read this book and one thing I am not grateful for is my anger with my husband and his work priorities. I am truly grateful this past year for God showing us the change in our childrens schooling and deciding to homeschool it has been the hugest blessing in our lives and very rewarding. This year a staff member stole from us over a long period of time--we knew things were going missing but there was no way to find out who was guilty. She was finally caught but with such a low value item that she was not prosecuted. Among the things she stole were the only nice pieces of jewelry I'd ever had. We continue to find more things missing that we are fairly sure she took. The final straw for me was finding that she got into our Christmas ornaments and dumped them out into the main trunk, stealing the tin that the delicate ones were carefully packed in. Thankfully, she didn't take the ornaments (most of them homemade by the kids) but the tin was also sentimental. I would love God to change my heart so that I am no longer bitter. This sounds like a book that I could use, Carrie. Right now, the thing I'm least grateful for are the many, many difficult aspects of pregnancy (for me--I know I'm blessed to BE pregnant--I don't mean that AT ALL, so I hope no one takes it that way!). I want this pregnancy to be better than the last at least in terms of MY ATTITUDE. When I was going through a hard time a friend shared this scripture with me, Phillipians 4:11, "Not that I speak in respect of want: for I have learned, in whatsoever state I am, therewith to be content." To be content, or in other words happy, in whatever situation I find myself in can be very hard. The key I have found to help me is to find some thing to be grateful for because of the situation. I think of Corrie ten Boom and her sister thanking God for fleas because it kept the guards out of their section. The start of our farming season was awful. We had our first crop of hay down and it rained off and on for 28 days, in the deserts of Nevada! 1/3 of our yearly income was in that crop that was totally ruined. What kept us going was that we had prayed for rain. God had answered our prayers but on His own timing. We were humbled because of the situation and learned to rely more on God. I'm sorry for the difficulties you've had to endure. Like most people, I've had my own challenging years (the hardest was when I was demoted in a job in a very public and humiliating way and my dad died from cancer. In fact, I find it difficult to stay positive. There are plenty of negatives popping up almost daily. From my own studies of Paul's "secret of being content in any and every situation," I've put together a simple little book of my own called Journey to Joy (http://amzn.com/144218776X). I would enjoy reading Demoss' book, too. I am not entering the contest, I also own this book. thank you for your honesty. I have been challenged as I have read this book(not done yet). I have been having a year that needs to end, it was refreshing to hear someone else share such feelings. real things have been tough, even wrong, this year. however, God doesn't say "be grateful when you are happy". In everything give thanks...EVERYTHING. So thank you for sharing your journey, I am praying my heart grows in gratefulness as I take the 30 day challenge as well. God Bless! I am grateful for a husband who stands by me through thick and thin, and all of my ups and downs. You don't have to enter me in the giveaway, but I just wanted to let you know how much I appreciate you sharing these thoughts with us. I'm so sorry that 2009 has been so rough on you and Jonathan, yet you are encouraging and inspiring as you write about your new resolve as a result of this book. Thank you. The reason you don't have to enter me in the giveaway is because I bought a copy a few weeks ago. Yet...I haven't cracked it open. Haven't even read the first page. In part, because I'm afraid of all the conviction and discomfort that are bound to go along with my reading of it! I know it'll be good, but still...sometimes I wallow in my comfort zone a bit too long. i think i'll have to buy this book, based on what you have said. I have felt like i did not handle well the chaos of these past 3 yrs. Yet, i am seeking to learn the lessons the Lord wants me to learn from all this. At the minimum, I think that while i certainly did pray and sought to trust Him, and also while i knew others were holding me up by prayer, i also feel like i was pretty whiny (and thus probably was.) Not thankful; and fundamentally feeling like i "should" have been able to "handle it all" on my own. Also deep sadness, tinged with a touch of self-righteousness and bitterness, over a difficult relationship. Sigh. i strive to have an attitude of gratitude, but it would be better to do a project of overtly concentrating on it! One thing I'm not very pleased with this past year is my walk with the Lord. On the other hand, I'm very thankful for His wonderful saving grace and open arms to receive me back into fellowship with Him. Your post really resonated with me. This past year our church saw a huge upheavel. I am determined to put to death this bitter feeling I have about it all...and more specifically the people who are responsible. God allowed it, it is being used for good, and I need to let go of my need to see justice and be thankful. I would read this book in a heart book. One of my favorite things to do is really wrestle through a book...and this sounds like it would be just that. I don't know that I can say I would love to win this book, but it sounds like a book I need to read. Thank you for your vulneribilty and openess. Much of what you say I very much identify with (not just this post, a lot of the time) and I know God has used some of your posts and book reviews in my life. So thank you for being a blessing in my life. I am trying to be grateful for God's perfect plan and timing. I want another baby so very much. It is my heart's desire to have a large family, and I would love to adopt and have more babies too. But my DH, who loves the Lord and is a wonderful husband and father, feels we are done. I know God has his hand in our lives, and I know it is a small thing compared to other's stuggles (just tonight, a friend lost their son), but it is hard to trust Him at times and that is my heart's desire. I love this topic and can certainly use more inspiration in this area! A. I'd like to totally over come being upset or bitter over Failed Labors. Areas of my life that I devote myself to...be it hours, days, weeks, months, or in some cases years only to see them crumble before me into heart-breaking life changing loss. This year has been full of them...and just when I think I've surrendered it all to the Lord...I find myself in tears all over again. B. I am truly grateful for my husband, my son, my life and those in it...and the many wonderful providences (like my husband's new job) that have occurred in the past month(s). May God indeed teach us (ME) to be truly grateful and give Him glory in the times of feasting as well as the times of famine. Thank you for your post on this book...and the window into your own heart and soul. Bummed that I missed the giveaway, but I am going to put it on my to-read list. Sounds like something that I need to be reading. As for your questions, one thing that I WANT to be grateful for is my singleness. I had a period of contentment, but I'm back on the other end, wanting what I do not have. Something that I AM grateful for is a church family who loves me.